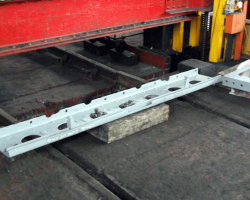 The new frame section in place with its front edge finish welded to the original portion ahead. 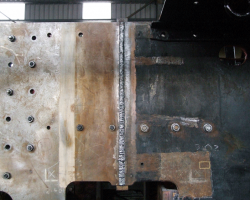 Welding steel of this thickness is a skilled and intricate job to ensure penetration and a lack of void spaces. So far so good. The rear of the new section is still merely tacked in place. 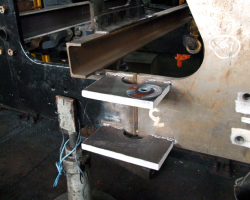 This photo shows both some of the measurements taken and also the bracketry erected to ensure the frame sections are truly vertical. Specially made keeps ensure that the two sections of frame, old and new, remain in perfect alignment. Further measurement and marking. 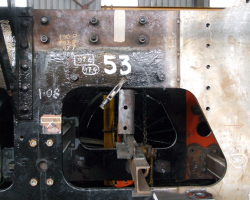 Presumably, it all makes sense to SVR Engineer Brian…! The full length of the left hand frame has now been cleaned down, prepared and given a coat of grey primer. 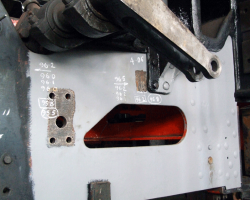 Also in primer is this section which fits above the hind buffer beam. 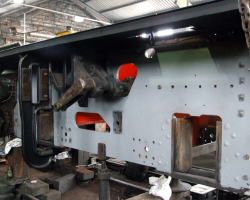 Among its tasks, it is the rear location of the footboards once the cab is complete.